Groundwater flow direction representation is useful to understand the actual and predicted conditions of the groundwater flow regime. The arrow direction and magnitude give a quick perspective of the main groundwater flow directions and the interconexion between sources and discharge points. Flow direction vectors wasn´t a very common feature in groundwater modeling with the open source stack until the development of Flopy library that has a special tool for quiver plot representation. This tutorial show the complete workflow to determine the flow directions from a MODFLOW model done with Model Muse. The scripting insert a background image, georeference the model from parameters exported as comments, and export the resulting figure as a PNG file. The tutorial is done in Python 3 on a Jupyter Notebook. 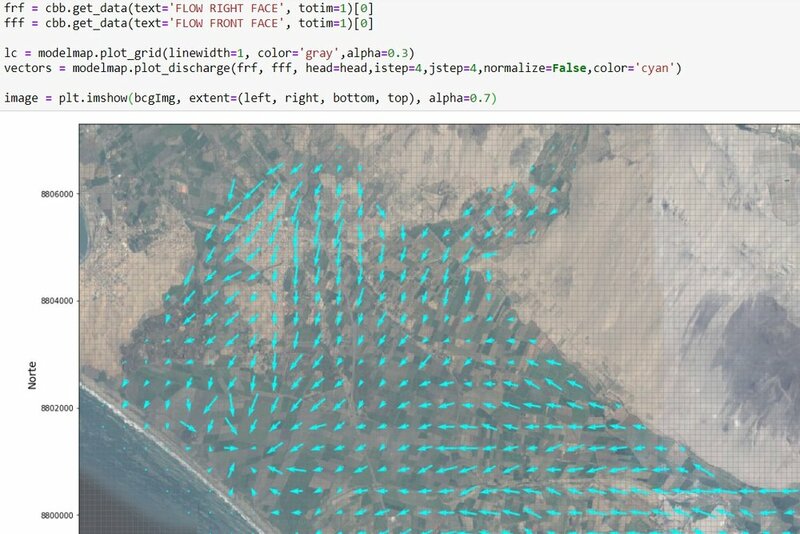 From numpy, matplotlib and flopy as well as Python core libraries. Model Muse inserts some geospatial parameters as comments on the DIS file. We have to import it by opening the DIS file and apply the parameters to the model object. Note: The EPSG code have to be set by hand since it is not written on the DIS file. The figure is generated as a matplotlib figure, where flow direction vectors overlay the background image. There are options to filter the number of arrows with the istep/jstep, this is highly recommended to enhance the representation and user experience. You can download the requiered files for this tutorial on the following link.